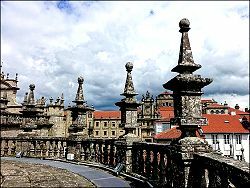 The city of Santiago de Compostela (often shortened to just Santiago), the capital of the Galicia region, is said by some, to be the most attractive of all of Spains' cities. It is even described by Unesco, who designated it a World Heritage Site, as "one of the world's most beautiful urban areas". 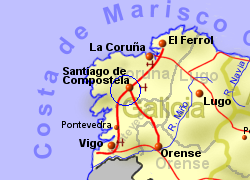 The city lies 30Km inland at around 200m above sea level and has a well preserved old quarter, with narrow streets (paved in granite) and historic buildings, which includes the cathedral. 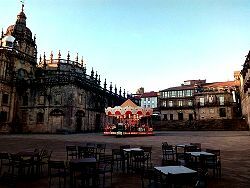 The city is possibly best known for the shrine of St James in the Cathedral. 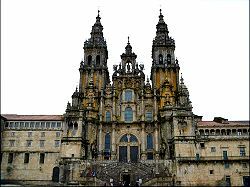 For a 1000 years, pilgrims (and those who just want the walk), have been trecking along the well worn paths from France and across northern Spain, along the Camino de Santiago (or in English, St James's Way). 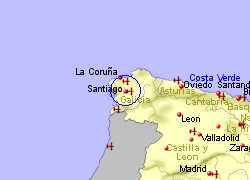 Nowadays, routes to Santiago start from most European countries. 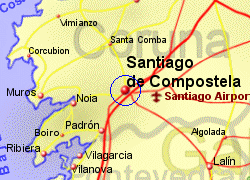 Map of the Santiago de Compostela area.